To top off a redesigned 8,000-square foot custom home in Cape May, New Jersey, architect David Schultz specified weather-resistant polymer shake roofing tiles from DaVinci Roofscapes. 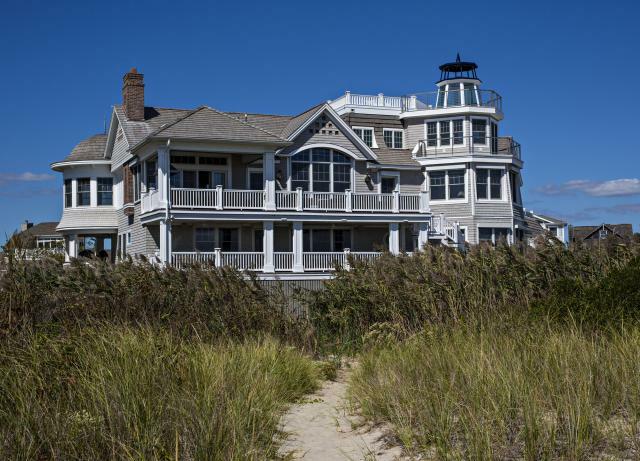 The custom beachfront home includes decorative architectural elements such as large covered porches, open decks, a lighthouse skylight, a widow’s walk, facade vents and large windows to capture ocean views. The dwelling itself features subtle curved edges to complement styles found in New England. “We used DaVinci’s solid shake accessory shingles that match their roofing product line to achieve curved roof lines that we had installed along exposed roof edges,” says Schultz. “This product is impact-resistant so we know it will help protect the home from severe weather. It also has a 50-year limited warranty that gave us even more confidence in specifying this product for the roof. The Multi-Width Shake roofing products specified by DAS Architects are Class 4 impact rated and have been rated Class A for fire retardance. The cedar shake alternative roofing materials have also achieved the highest ratings for straight line wind testing at 110 mph and have passed testing for extreme weather conditions. DaVinci shake shingles feature both wavy and straight grains throughout the blend for an authentic appearance. Multiple widths on the shake tile roof help create a natural, non-repeating look that can be laid in a straight or staggered pattern. The tiles resist curling, cracking, fading, mold, algae, fungus and insects, making them ideal for installation in a wide variety of geographic areas. To learn what other architects are saying about DaVinci products, visit The DaVinci Roof – A Luxury Roof for the Architect. Images courtesy of DAS Architects, Inc. and Peter Paige Photography.